Moog Music has announced a contest to give away the last Anniversary Edition Minimoog Voyager produced in 2004, the year of inventor Bob Moog¹s 50th anniversary in music. One lucky Moog fan will be selected on January 23rd at the 2005 NAMM show in Anaheim CA. The winner will have the opportunity to pick up their new Voyager at Moog¹s booth, number 6016 on the show floor, or have it shipped. Founded in 1954 by Bob Moog, Moog Music kicked off its 50th Anniversary at winter NAMM show in Anaheim, releasing the Anniversary Edition Voyager. In August 2002, Moog Music released the Minimoog Voyager, an all analogue performance synthesizer incorporating virtually all of the functions of the original Minimoog synthesizer (produced from 1971 to 1984) and a number of new features that makes this the Minimoog for the 21st Century. 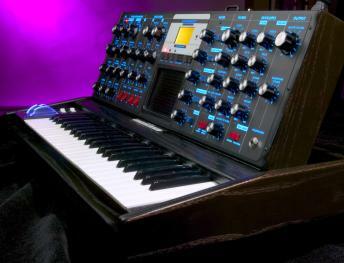 The Minimoog Voyager Anniversary Edition features a black cabinet and front panel and electric blue back-lit legends and pitch and mod wheels. The Anniversary Edition comes loaded with presets supplied by such musical luminaries as Herbie Hancock, Chad Hugo, Printz Board of Black Eyed Peas, James Lumb of Electric Skychurch, Fred Wreck with Snoop Dogg, Darrell Diaz, Khari Simmons with Indie.Arie, Geoffrey Keezer of Christian McBride, Frank Lucas, Jamie Muhoberac, Roger Manning, Jr. with Beck, and others, including some presets cooked up at the Moog factory. At its heart the Voyager is a 100% pure analog synthesizer - the newest operating system 2.0 fully releases its modern capabilities including transmitting High Resolution MIDI Continuous Control messages from the Voyager's front panel, a powerful internal modulation matrix called 'Pot Mapping', and create a polyphonic Minimoog using multiple Voyagers. The new features allow to transmit MIDI Pitch Bend, Aftertouch, and CC messages from Left Hand Controller, Keyboard, Touch Surface and Front Panel Controls. Master Mode features include Voyager Device ID and MIDI Key Order allowing to chain up to 16 Voyagers for a monster polyphonic synth.